It's been eight months since the introduction of the new Conquest system, and I'm still having fun. Despite of the many complaints people levelled against the changes in the beginning, for me the new system has already been much better at holding my interest than it ever was in its original iteration. 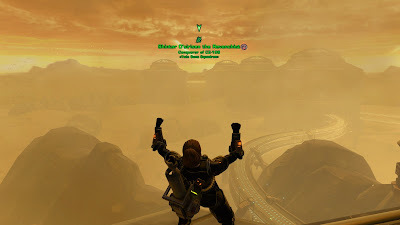 The original Conquest system had me playing intensely for about four months; then Shadow of Revan was released and my interest in Conquest points fell off a cliff. It limped on for another six months or so, with the occasional revival of interest whenever there was a Total Galactic War, but eventually I just started ignoring the whole thing completely. I do think the basic idea of being able to succeed without actually making it into the top ten has done a lot to make people engage with Conquest much more than before, but my own guild has also been a lot more successful, conquering more planets in those last eight months than we'd ever been able to claim before, and not just when Total Galactic War was on. We are getting close to hitting our limitations though, as we're not big enough to compete for first place on the large yield board, and we only have a small number of medium and small yield planets left to tick off. I've also been struggling with burnout a little bit, but as the frequency with which we attempt to race others for first place has slowed down that's been getting better. Another thing that keeps me interested is just watching the scoreboards to be honest. For example, the biggest Conquest guild on Darth Malgus is an Imperial guild called Stroke My Wookie [sic, the founder apparently didn't know how to spell Wookiee]. In fact, they got so big that they had to split in two just to contain all their members! Strictly speaking they also have a third guild on Republic side, but it seems that SmW are staunch Imperial loyalists for the most part, as Republic SmW is rarely seen on the boards and even seems to have downgraded its ambitions from medium to small yield. The two Imp guilds however have been quite dominant, sometimes claiming first place on two out of three planets at the same time. But then! Seemingly out of nowhere came a Republic guild called Exsilium. I still know virtually nothing about them, as they don't even seem to have a guild website, but they just showed up one day and started beating SmW to first place. Again, and again. Even without knowing anything about them, I kind of cheered for them simply out of faction pride and because it was nice to see someone disrupt what appeared to have become an almost-monopoly on Conquest victories. Apparently this served to sufficiently upset SmW to the point where they held a special "event month" to pull as many people as possible back into the original guild to refocus their Conquest efforts and beat Exsilium (I know this because they did in fact officially announce this on their guild website) - a goal at which they succeeded, though after they split back in two the fight for first place was once again back on. In an interesting turn of events, it now seems to be Exsilium's turn to spread themselves too thin, as they recently appear to have formed an Imperial alt guild called Fallen Exsilium. Last week they made their own attempt at conquering two planets at once but it didn't quite go as planned, as for a while they were pushed back into second place on both planets. I was watching the board with interest, wondering how it would all plan out. (For the record, Exsilium managed to claw their way back into first place on one of the two planets at least.) It's kind of like a nerdy equivalent of watching F1 racing I guess. Looking forward, I'm quite curious to see how the Conquest changes announced for 5.10 will shake things up. The biggest change from my point of view is that they will be introducing daily objectives to kill X mobs anywhere in the galaxy. Right now, while I don't think it's difficult to hit your personal target, it certainly requires a certain amount of focus, unless you're lucky and it's a week that particularly rewards your preferred play style. Generally speaking, you won't hit your target by just levelling and doing dailies though; you'll have to specifically target the featured activities each week. The new objectives might change that, and at the very least they will suddenly turn a lot of more casual players into active contributors. I'm excited to see how that will pan out. And now imagine all the fun you can have with guild XP being introduced and tied to conquest points. Yay!